This photograph was taken in the back court of No.11 Fairbairn Street in 1935. The window in the background is the Gorman family's house. I can't recall the rest of the names. Arthur Hendry is holding "chums" card. No5 Joe Welsh whose mother lived at No.45. Joe was a cousin to the McKnights. The Scott family whose son Peter is in the photograph also lived in this close. No.11 third storey was the McIntyres, later the McQuats, my family the Hendry's and the Gatherals. No.11 first storey was the McGhees and the Provans family. No 11 in the close was the Smiths later to be occupied by my family, the house on the right was the Gormans. ".....webmaster, thanks for the help. I guess I just had a mental block, either that or I didn't have my specs on. I didn't realize that you lived in Fairbairn St. In 1936 we moved from no.11 to the "pen" at No. 5. Even then I was a bit of a snob and moving to No.5 was "infra dig"
Webmaister : Peter have look at the photo above.....YOU ARE IN IT !!! 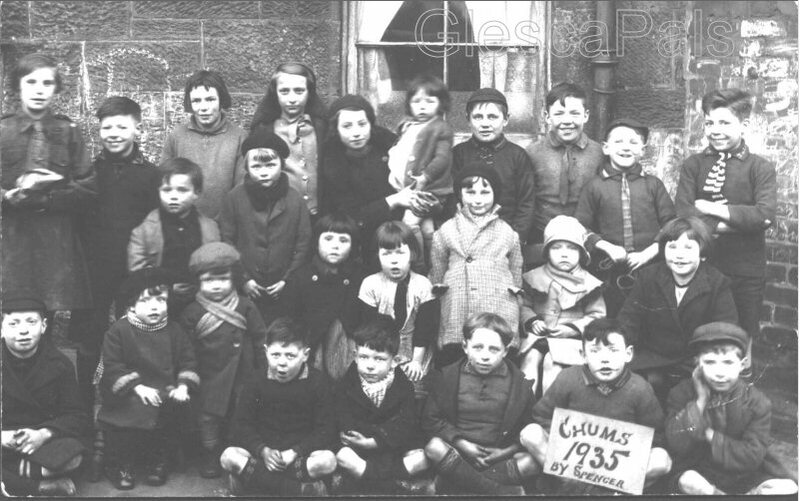 I was checking the Website and came across a photo "Fairbairn Street, Bridgeton 1935" and was surprised to see my two sisters and my brother and my cousins looking out at me. My Sisters are the two wee girls at the front with the berets and scarves my brother is on the front row second from the left. Nan & Jean & George Casey are cousins of the Mcknights and the Welsh's. My Gran was Helen Welsh who lived at 45 Fairbairn Street and my Uncle Joe and family lived at 5 Fairbairn Street. My Uncle John who was John McKnight Sen also lived in Fairbairn St. The Casey's lived in Springfield Rd but we had cousins called Cunningham's who also stayed in Fairbairn Street. I now live in Australia but my Husbands father came from Dunn Street but he was killed WW11 his name was Peter Verechia. Extract from e-mail, July.2011, Jean Morgan, Glasgow.